The MacRory Cup is the most coveted prize in Ulster Schools, and is second only to the Ulster Senior Football Inter-county Championship in terms of history, prestige, standards, and public acclaim. The Final is played each year on 17th March, and attracts an attendance in the region of 5,000 as well as a substantial TV audience. The earlier rounds of the competition also attracts significant numbers from within the school communities and from the wider sporting public. The origins of the MacRory Cup date back to 1917 when the Headteachers of the two leading diocesan boarding schools, St Patrick’s Armagh and St Macartan’s Monaghan, agreed to hold an annual Gaelic match between their schools. They were soon joined by St Patrick’s Cavan, St Columb’s Derry, St Malachy’s Belfast, and St Colman’s Newry, all also diocesan boarding schools, and Dr MacRory, Bishop of Down and Connor (and later Cardinal in Armagh), presented a trophy for this annual competition. We now live in an era in which 2nd Level education is available to all, but in the very different educational landscape of the 1920’s it was accessible only to those who attended these boarding schools. Participation in the MacRory Cup, therefore, in its early years was confined to those few schools. 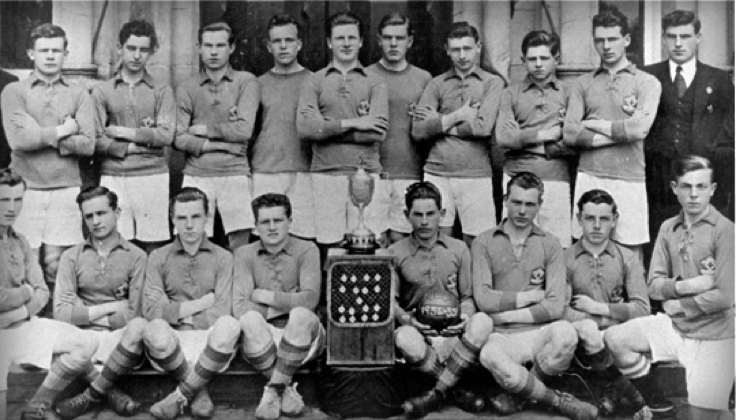 St Patrick’s Armagh were the first winners in 1923, and dominated the competition in its early years. First time victories by other challengers were recorded by St Malachy’s in 1929, followed by St Macartan’s (1930), St Patrick’s Cavan (1935), and St Colman’s (1949). The 1930’s was notable for the affiliation of a number of Christian Brothers’ schools. These were ‘day schools’ (i.e. non boarding schools) which catered mainly for boys from humble backgrounds, but they did not yet have the prowess to compete with the established diocesan colleges, as was confirmed by comprehensive defeats for Monaghan CBS (1935), and Abbey CBS (1944 and 1947). 1954 was a watershed year in that the triumph of Abbey CBS after a replay over St Patrick’s Cavan was the first MacRory Cup win by a ‘day school’; the Abbey repeated this feat in 1959 and 1964, but no other day school made the breakthrough until St Mary’s CBS in 1971; next came Omagh CBS in 1974. 1976 marks another significant landmark in the history of the competition although that particular Final ended in defeat for St Patrick’s Maghera. It ushered in an extraordinary sequence of 14 Final appearances by Maghera in the following 15 years, 8 of which were won, including 4 consecutive victories 1982-85. Those 15 years witnessed a legendary rivalry between Maghera and St Colman’s Newry when they faced one another in 10 Finals, including replays. These included the iconic 1989 Final, won by Maghera on the scoreline 4-10 to 4-9, a game which is widely and rightly regarded as one of the greatest ever played at any level in Ulster. Those were the days when the blanket defence would have been regarded as a distasteful, unchivalrous, and unthinkable option. Another feature of that particular era was a remarkable personal achievement which is unlikely to be repeated. Dermot McNicholl, currently a coach in Maghera, played in 5 consecutive Finals 1980-84, winning 4 medals, and captaining the team to 2 of those victories. The only other player to captain 2 winning MacRory Cup teams was Sean Blaney, St Colman’s Newry (1949-50); coincidentally, his son, Greg, captained St Colman’s to the 1981 title. The 1990’s marked the arrival of St Patrick’s Dungannon and St Michael’s Enniskillen at centre stage, and accelerated change in the educational domain with the disappearance of the remaining boarding departments in schools, and an equalisation in standards across a greater range of schools. The new millennium produced a victory in 2000 for the original kingpins, St Patrick’s Armagh, their first victory since 1953, and the next decade was marked by the emergence and appearance of Omagh CBS in 7 Finals. The MacRory Cup, first donated by Bishop MacRory in 1923, is now fiercely contested by 10 schools annually, and a feature of each successive year is the number of genuine contenders and the unpredictability of the outcome. That original trophy was replaced in 1962, and that trophy, in turn, was retired and donated to the O’Fiaich Library in February 2012. A magnificent replacement trophy has been donated to Ulster Colleges by Cardinal Brady, thereby perpetuating the historic link between the Archdiocese of Armagh and this unique competition. The trophy won in March 2012 by St Michael’s Enniskillen is therefore the 3rd Cup to bear the name of the original visionary, Cardinal MacRory. ** Both schools shared the MacRory Cup – replay cancelled due to foot and mouth. Until 1935 the MacRory Cup was played on a league basis with the league winners claiming the title.